In the seven essays translated for this volume, Ye Fu writes about his parents and grandparents, whose tragic lives he came to understand only after their deaths, and about friends that he has loved, lost, and learned from. Blending memoir with historical reflection, he probes not only the Maoist abscess beneath his country's current anomie but also the virtues that enabled some to transcend it. With photographs and maps. Available in softcover and e-book. In "Requiem for a Landlord," Ye Fu mines his family's long-buried memories to dissect the first phase of Chinese Communist rule, often optimistically described as an agrarian reform movement. He finds rooted in that era an "Education in Cruelty" whose impact is still felt almost 40 years after Mao's death, and he wonders if the only way to preserve one's humanity is to stand aside from this world like the old friend he sketches in "A Man Apart." 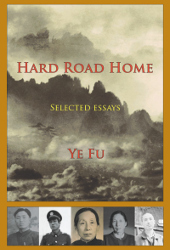 The sensitive, eloquent, and unsettling essays of Hard Road Home (usefully annotated by the translator) refract a vast history through the lives of vividly remembered individuals. Ye Fu's meditations provide a pattern just as useful for the contemplative Westerner as for his Chinese readers. He does not simply confront the terrible facts of his civilization's past, but accounts for them, patiently and poignantly drawing the humanity out of a cruel and corrupted history. Copyright © 2014 Ragged Banner Press. Best viewed with Mozilla Firefox.